Sea Sentinels offers assistance to Owners in choosing the right recycling yard for their ships - yards that meet expected standards of safety for their work force, practice environmentally sound recycling processes and are geographically best suited for the ship being recycled to reach. 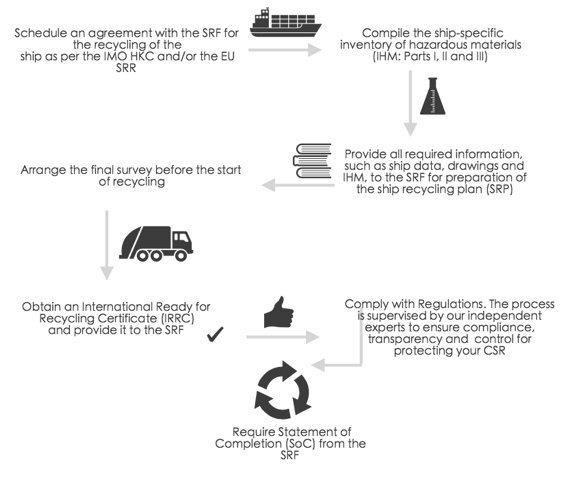 Furthermore Sea Sentinels offer on-site monitoring on behalf of the ship owner on the progress of recycling, from arrival of the ship until completion of recycling, to ensure safety, environmental and health procedures as required by regulations and as laid down in the Ship Recycling Plan are closely followed. Monitoring is done by experienced personnel from Sea Sentinels who make regular and detailed illustrated reports to Owners. Regarding international regulations we support and lead your company to meet compliance.